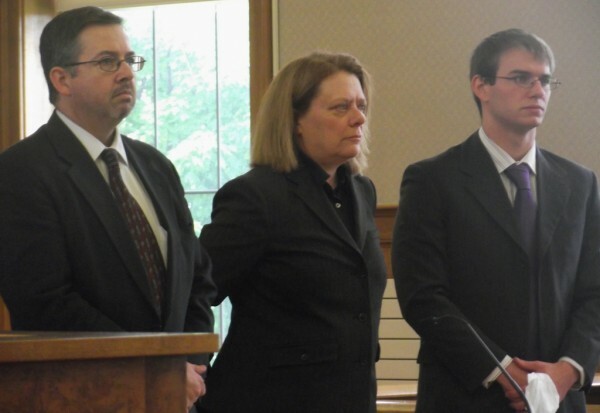 Thayne Ormsby (far right) listens in Aroostook County Superior Court in Houlton on Thursday, June 7, 2012, as he is sentenced to life imprisonment on each count for the killings of three people in Amity on June 22, 2010. Next to Ormsby are his attorneys, James Dunleavy and Sarah LeClaire. Thayne Ormsby turns his gaze toward the media on the day of the opening statements in his triple homicide trial in superior court in Houlton on Monday, April 9, 2012. 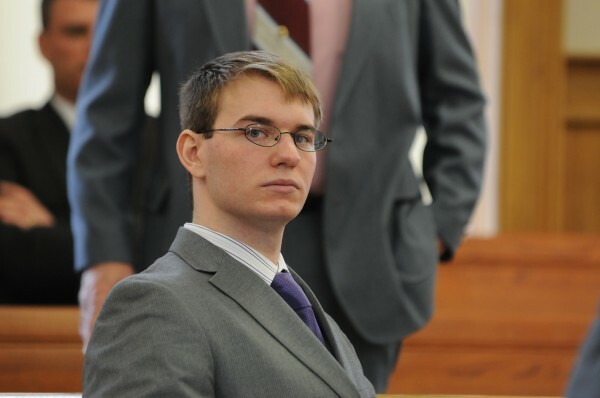 HOULTON, Maine — Appearing aloof as the victims’ families expressed their anguish earlier in the day, the 22-year-old who killed three people in a rural home in Amity in June 2010 was sentenced Thursday afternoon to three life terms, one for each murder. Since parole in Maine was abolished in 1976, Thayne Ormsby will spend the rest of his life in prison. Ormsby showed no visible emotion as he stood before Aroostook County Superior Court Justice E. Allen Hunter while the sentence was being handed down. Hunter also presided over the trial. While acknowledging that Ormsby had been denied “social justice” in that he was subjected to physical abuse and deprivation in his childhood, Hunter said that those circumstances were not enough to mitigate the severity of killing three people. Ormsby was convicted on April 13 in the stabbing deaths of Jeffrey Ryan, 55, Ryan’s son Jesse, 10, and Ryan family friend Jason Dehahn, 30, all of Amity, on June 22, 2010. They were found dead about 27 hours after the killings at the elder Ryan’s home on U.S. Route 1, according to police. All three died of multiple stab wounds. Ormsby, an Ellsworth native who moved to Orient, a town just a mile from the crime scene, entered pleas of not guilty and not guilty by reason of insanity to the charges. Because of the dual pleas, Ormsby was tried in two phases. He was represented by attorneys James Dunleavy and Sarah LeClaire of Presque Isle and found guilty of the murders first on April 13 and then criminally responsible for his crimes on April 19. Ormsby also was found guilty of arson for burning Jeff Ryan’s truck after he stole it from the murder scene. Ormsby also was sentenced Thursday to 15 years in prison for burning the truck. That sentence will be served consecutively with the life sentences. If he makes any money in prison, Ormsby also was ordered to pay for the funeral expenses of the victims and to pay money into the victims’ compensation fund. Ormsby moved to Orient in the weeks before the murders to live with Robert and Joy Strout. Court testimony revealed there was animosity between the Strout family and Jeff Ryan because Ryan had once had a relationship with Tamara Strout, Robert and Joy’s daughter. Tamara Strout eventually had a child with Ryan. Strout also told Ormsby that Ryan was a drug dealer, which there is no evidence to support. During the hearing, Deputy Attorney General Bill Stokes requested that Ormsby be sentenced to life in prison for the slayings and 30 years on the arson charges. Dunleavy and LeClaire requested that Ormsby have a chance to get out of prison one day, but they did not ask that a specific length of time be served. Family members of the victims, however, pushed for as much as they could get. Robert Dehahn, Jason’s father, said that it felt like a knife had been driven through his own heart when a son he loved deeply was killed. He said that if given a choice, he would want to see Ormsby put to death, but he said Ormsby would one day get what he deserved. “May God not have mercy on his soul,” he said. Jason’s 12-year-old daughter, Skyler Dehahn, also spoke, after her mother, Bridgette Ireland, talked about how her daughter still has nightmares about her father’s death and can’t sleep without a light on. She also said she had to watch as Skyler cried on the night of the father-daughter dance at her school because she no longer had a father to take her. Skyler Dehahn spoke through tears about how much she loved and missed her father and said she dreads the end of the week. “I cry because that means the weekend is coming, and I always spent the weekends with my father,” she told Hunter. Ormsby raised his eyebrows and seemed taken aback when the family members spoke. He cried for a few moments, however, when his mother, Maria Ormsby, talked about how happy she was when he remembered to send a note to wish her a happy Mother’s Day. His grandmother, Janice Wilbur, said that he was a good kid growing up and that she was proud he recently received his high school diploma while incarcerated on the murder charges. His uncle, Steven Ormsby, joined all three in asking the judge not to sentence him to life in prison. “We still have hope for him,” said his grandmother. Hunter didn’t agree. After Ormsby said that he did not wish to speak in court, Hunter said that the killer had gone to the Ryan home that night with the intent to kill Jeff Ryan and that when he saw two other people there, he didn’t abort his plan, he simply “expanded” it. He added that he had no doubt that all three victims experienced conscious pain and suffering before their deaths. He also took into account Jesse Ryan’s age and the fact that Ormsby had showed no remorse for his crimes. He noted that he had done research and found that only one person in Maine had killed more people in the state, convicted murderer Christian Nielsen, who murdered four people in Newry in 2006. “Mr. Ormsby is tied for second place in the annals of mass murder in Maine,” he added grimly. Hunter said he did take into account testimony from Dr. John Lorenz, a psychologist for the defense who said that Ormsby was subjected to physical abuse and neglect as a child and that he did not receive needed counseling when he was removed from his mother’s custody as a 12-year-old. At the time, Lorenz said, he had deep-rooted problems and was “deeply disturbed.” Lorenz also said Ormsby was psychologically immature at the time of the murders even though he was 20 years old. “But I must hold him accountable,” Hunter said. Stokes said after the sentencing that he was happy Ormsby was given life in prison, but said there were no winners in the case as the victim’s families will feel their losses for the rest of their lives. He credited Ormsby’s attorneys for their work and also praised Robert Dehahn, who was in court every time Ormsby was scheduled to appear. “In this case, there is nothing to be happy about,” Stokes said. Robert Strout, 64, was sentenced on May 23 on charges of hindering apprehension and arson for his role in helping Ormsby conceal evidence in the murder investigation. He is serving four years in prison, a sentence that resulted from a plea deal with the state. Ormsby’s attorneys have already indicated that they will appeal the guilty verdicts in the murders. Stokes said the attorneys now have 21 days to file the appeal.